If you’re anything like me (a typical Facebook admin whose day does not revolve around Facebook), you don’t have time to spend hours upon hours digging into the depths of Facebook’s Insights. Managing a Facebook Page is already a lot of work and it’s not the only job most of us have. While I don’t recommend completely ignoring Facebook insights (at least once a month you should sit down and read through some of Jon Loomer’s posts and then dig into your analytics) on a day-to-day basis there’s a quick and fairly easy way to track the real engagement on your posts and see what is and isn’t working for your Page. What’s the magic trick? Post Clicks! If you’re skimming your Timeline on the new Facebook Page layout or on the mobile app you can click on the number of “people reached” and it will pull up all of the stats for the post. You can see reach, engagement, and actions (post clicks). If you can’t access this information from your Timeline or mobile you can jump into the Insights and click on “Posts” then click on an individual post to see these stats. 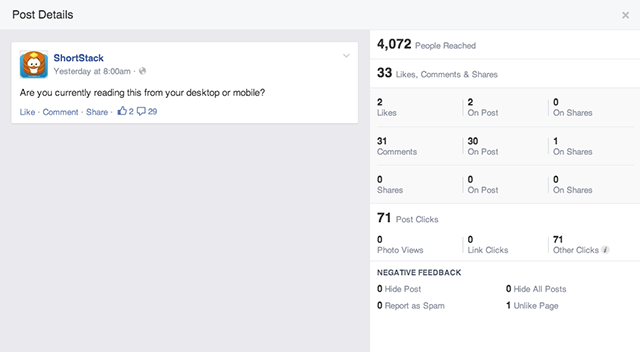 Whether you get there from a mobile device or your desktop, I want to talk about this “Post Clicks” stat. I’m not going to lie, this is my favorite insight because it makes me feel better about the engagement on our Facebook Page. At ShortStack we have 70,000 Facebook fans, yet on a daily basis at first glance our posts seem to get minimal interaction. We average about 5-10 Likes per post and a few shares here and there and minimal comments. As an admin these numbers are discouraging. But then I remember that these numbers aren’t telling me the true engagement on my posts! Yippee!! The “Post Clicks” metrics seem to be the most confusing for people because they also contain the mysterious “Other Clicks.” With any post you are going to see the Likes, Comments and Shares. You’ll also see the Photo Views, Link Clicks, or Video Plays depending on the type of status update you posted. However, just because someone didn’t actively engage with your post through a Like, Comment or Share, doesn’t mean they didn’t take any action on your post. The number you want to look at is the “Other Clicks” number. This number is any post click that isn’t a Link click, photo view or video play. These clicks can include clicks on people’s names in comments, clicks on the like count, clicks on the time. In a nutshell just because someone didn’t click on your specific post, if that post encouraged them to click anywhere else on your Page, you’ve done a good job! 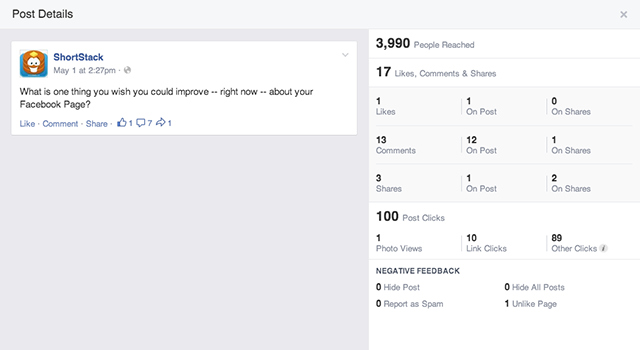 This is the easiest way to see how your posts are doing without spending hours digging into your Facebook insights. 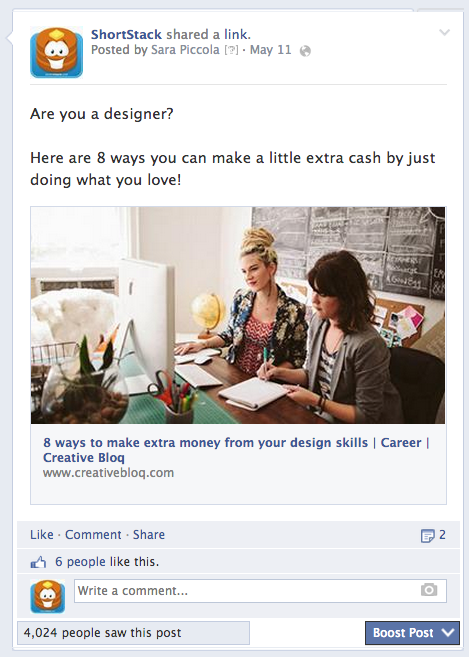 The image below is a screenshot of a post we made showing designers how to make a little extra cash. From first glance it doesn’t look like it did that great; organic reach of 4,024, 6 Likes, 1 Shares and 0 Comments. But, when we dive into our insights we see a different story. What we learn is that even though this post only received minimal Likes/Comments/Shares, it received quite a few clicks; 35 people clicked on the link itself and 166 people clicked somewhere else. 201 Post Clicks feels a lot better than 13 Likes, Comments and Shares! So next time you’re feeling down in the dumps about your reach, remember to look at your real reach! You can also check out our latest resource, 22 rules to remember to combat declining reach! 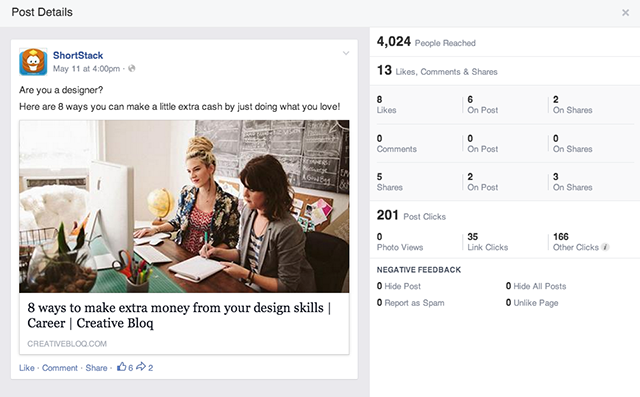 You can also use the “Post Clicks” feature to determine what content works best for your Page. By organizing your insights by Engagement you can look at posts that have similar reach and compare them. I’ve done this with some of our posts. In the graphic design example above, the post reached 4,024 people. So for this study I looked at some other posts that reached that many people to see how they compare when looking at the Post Clicks. 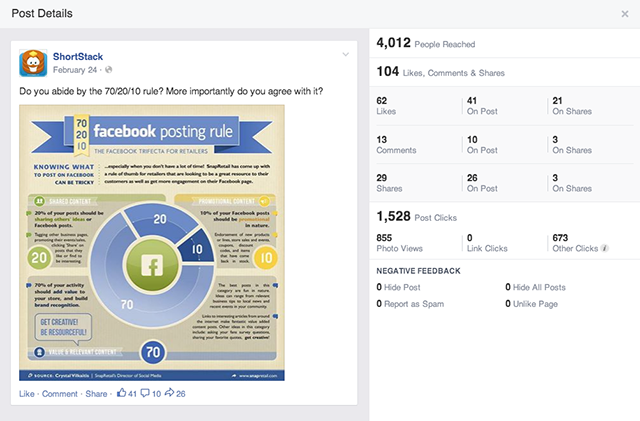 Below is a screenshot of an Image post we did that had the same organic reach as the graphic design post. However, this post got much more engagement and clicks! Next up is text update that’s asking fans a question about their business Page on Facebook. Reach is in the 4k mark and on this one we see that clicks are much lower. Here’s another text update asking fans a question, however this post received many more comments so the engagement was higher but the Clicks were lower than the last text only post. Finally, we have a video post that once again falls in the 4k reach and even though only 19 people Liked, Commented or Shared the video more than 250 people watched it and 167 people were intrigued to click somewhere else on our Timeline because of this video. The time and date of each of these posts could affect their engagement levels, but there are a few things we can learn from looking at these five posts that all received the same organic reach but quite a different range of engagement. 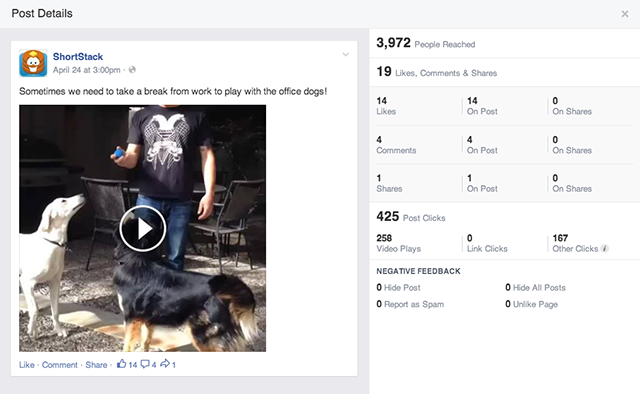 In a nutshell we can see that videos and Images do really well for our Page. Even though text only status updates asking fans to chime in on a question don’t garner the most engagement, they do garner quite a few “other clicks” which means businesses are seeing them and engaging with other aspects of the ShortStack Page, but they’re not inspired to actually comment. Lastly, our fans respond well to valuable tips (which we already knew), but sharing valuable Links leads to more “Other Clicks” and if we want to keep people engaging on the present post, a valuable infographic or graphic is the way to go. Clearly this is a small study to see what works and doesn’t work on your Page but by taking a few minutes looking at your basic Facebook insights you can adjust your strategy accordingly if something isn’t working for you.